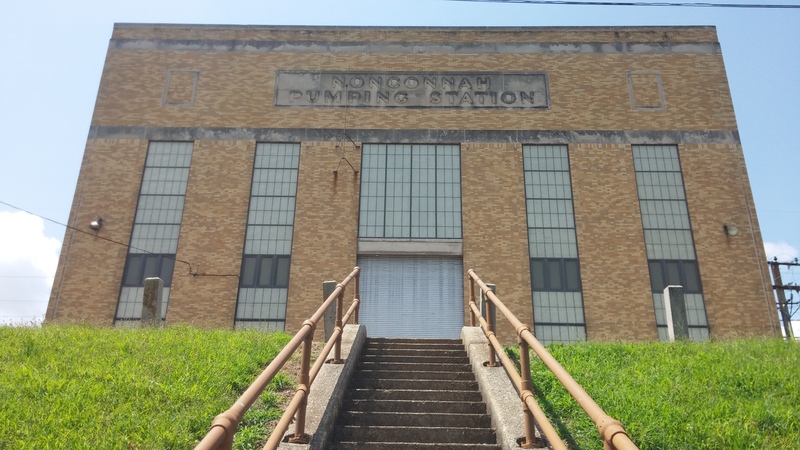 NONCONNAH PUMPING STATION – ADANAY. 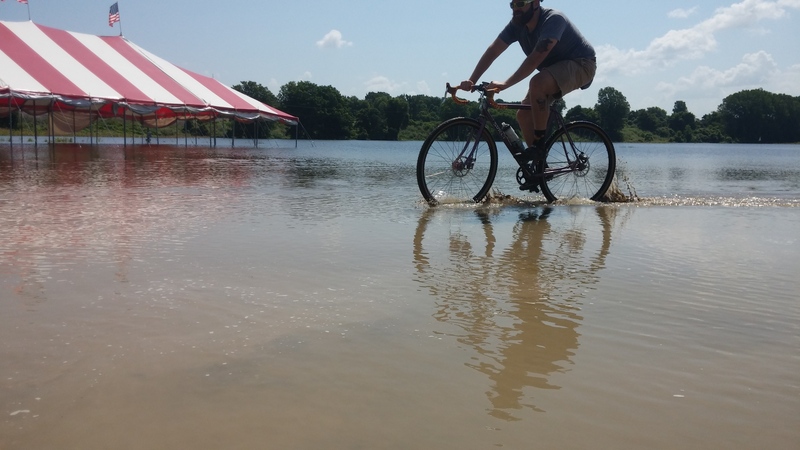 Cyclocross bikes have a strong showing in Memphis. Their versatility and effectiveness make them the easy choice for people wavering between road and mountain. I came to a cx bike from riding fixed. I started working at Peddler Bike Shop and bought an old Trek frame from a short-haired Jim Cole (his hair is down to the middle of his back now so that might tell you about how long ago this was). I set it up bar-end, 1x, with some 700×30 Vredestein cross tires. It was my urban assault bike and did a lot of trailer hauling. It wasn’t so good of a race machine, the chain dropped after every barrier. Here it is in Urban Velo #12 (that was the Happy New Gears Alleycat beer). I didn’t do too much out-of-city exploring but I have since (several bikes later) learned that cx bikes make a perfect bike to ride the gravel levees and roads in Arkansas; that is, if the Mississippi River will let you. Our ride started with the Peddler Crew and their Sunday morning employee ride. From Overton Park to downtown via New Chicago (which is soon going to be a destination) and Uptown. After hanging out downtown we split and trekked across the bridge. If you take the South side of the bridge you can get a very nice view of the Mississippi. Take the North side of the bridge and you get a very nice view of the Harahan Bridge. This trip over was on the North side and we were able to check in on the construction process which is going great. The snaking path towards West Memphis was short-traveled as we came upon the fireworks tent wading in water. We had a few minutes of fun then headed towards the gravel cut and realized it was in more water than the fireworks tent. We made some Stand By Me jokes and talked about stealing a boat but resolved ourselves to heading back to Memphis on the South side of the bridge. As much as we wanted to ride some gravel we pointed toward T.O. Fuller for the canopy. A little shade on a hot July day is a bankable destination. But you keep your eyes open and your schedule clear and the gravel sometimes just appears. The headwind was picking up and as I was calling for us to paceline when Carter spied a bit of gravel. It’s great to ride with friends who don’t squash their sense of wonder or urge for adventure. 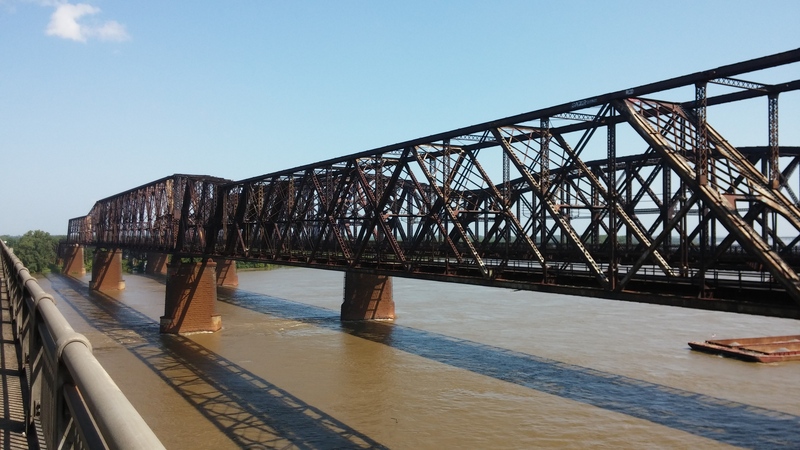 We shouldered our bikes across the railroad tracks and the little service road took us to the Nonconnah Pumping Station, a light brown block bulging from the levee like a rook. Built in 1940 by the Corps of Engineers this station can pump about 7,500 gallons of water PER SECOND. It is one of 7 pumping stations in the area and combines with our levees, reservoirs and flood walls to keep most of us dry. This station won’t kick on until the river gauge reaches 33ft – it’s currently at 32ft. Remember Arkansas is flooded. Stand By Me jokes aside, after leaving the Nonconnah Pumping Station we actually did walk some railroad tracks when we ended up at a dead end on the gravel service road. That short walk put us essentially at the corner of Mallory and Latham which is, coincidentally, where I wanted to end up on the original route of the President’s Island ride. It is also where the South Memphis Greenline is programmed. It sits as a gravel road here and we scouted it until it dead ends. 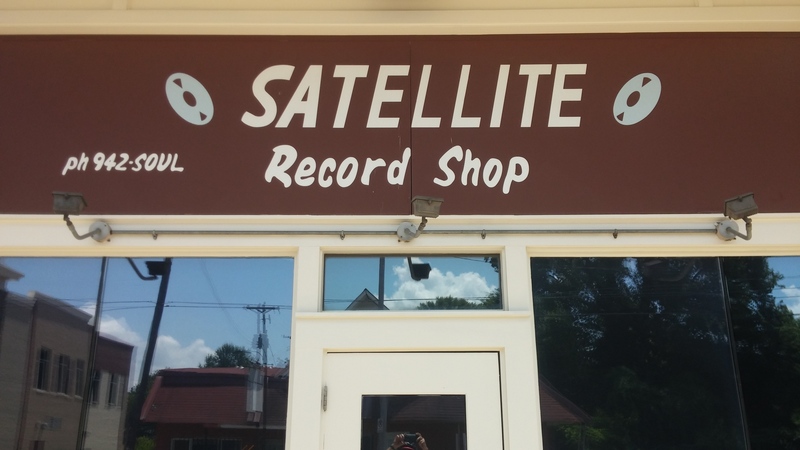 No one felt like dealing with poison ivy this week so we head back and up Latham to McLemore to make our way to Soulsville. I almost caused a bicycle pile-up as I spotted a shop that I had all but chalked up to urban myth. No signs, tiny, and unless you walk or ride past it you’ll never know that it’s stock full of vintage bicycles. A handful of people ever even mentioned this place and getting the exact location, well, I thought it was at the bend where Southern becomes McLemore and that it had gone away and DJ’s Cuts and Styles took the bay. But no. This time I just looked up at the right time and even found the door open. Linda is a collector. Comic books and bicycles. I didn’t get a chance to flip through the box of comics and only got to lay eyes on the front room of bicycles. Linda was wary of three guys poking around her place but we spied some decent bikes. Raleighs, Schwinns, GT’s, Cannondales, and a Centurion or two. I’m interested in those. It would be amazing to see Linda turn her passion into a business. Her location is almost in the midst of a bike shop desert; She’s closer to downtown than she is to Revolutions and she’s surrounded by a neighborhood, an award-winning charter school, a college, and industry. She’s 2 blocks from a programmed greenline and bike lanes line her street. I hope you are reading this Linda: call me. I will help you get this started.